Are Some Williamson County TN Elected Officials Sleeping With the Enemy? The Muslim Brotherhood is a designated terrorist organization in many Middle Eastern countries, such as Saudi Arabia, Egypt and the United Arab Emirates (UAE), along with many of its sister groups such as the Council on American Islamic Relations (CAIR), Al-Nusra, Al- Qaida, Hamas, and ISIS. 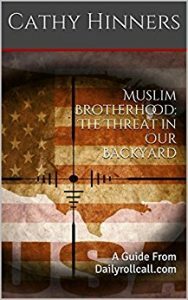 In the United States, under the new Trump administration there is an increasing effort by Congress to designate the Muslim Brotherhood and others as well. So why would some elected officials in Williamson County Tennessee support and embrace (perhaps unknowingly?) those with the same ideology? What is their ideology? On the Muslim Brotherhood’s official American website, ikhwanweb.com, in a tribute to the anniversary death of its founder, Hassan Al Banna, they recall a quote he had used whenever describing the group. “We know what we want, and we know the way to achieve it. We want the Muslim individual, the Muslim household, the Muslim people, the Muslim government, and the Muslim state, which leads Islamic countries, unifies all Muslims, regains their glory, gives them back their lost territories and usurped homelands, and flies the flag of jihad and the call to God until the whole world is truly happy, through the teachings of Islam”. So just who are they embracing in Williamson County TN? Daoud Abudiab, a Palestinian man (who by the way in 2008, sued the U.S. government to compel approval of his application for naturalization in the U.S. (case No. 1:08-0018). (He publicly lamented several years later that “he was one of the ones that left.”) who founded the Faith and Culture Center, a non profit corporation located in Nashville TN, whose mission states their purpose as “promoting a history of coexistence between people of faith and diverse cultures of the world. Those schooled in the understanding of dawa, understand what interfaith is all about. This becomes an issue when it has been revealed on many occasions, Mr. Abudiab was in attendance at a Muslim Brotherhood conference in February of 2015. The USCMO (U.S. Council of Muslim Organizations) is the self-styled “first national Muslim (Brotherhood) political party.” Founding members of the Council (many with ties to HAMAS), include unindicted Holy Land Foundation co-conspirator named Muslim Brotherhood organizations, and AMP (American Muslims for Palestine), one of the most vocal Muslim Jew-hating organizations in the U.S. Pictured below are Mr. Abudiab, and directly in front of him is CAIR CA. Director Hussam Ayloush. That second line is Arabic (“الشعب يريد إسقاط النظام‎‎”) for “The people wants to bring down the regime.” This is the goal of the Muslim Brotherhood, “destroying the Western civilization from within”. He is a member of the Family of Abraham (FoA), the red-green alliance connected to the Boycott, Divestment and Sanctions (BDS) campaign against Israel. President and founder, of the Faith & Culture Center (FCC), the sole focus of which is to market the myth of Islamophobia through a program called “Our Muslim Neighbor,” a project of Religions for Peace USA (RFPUSA), an organization which is tied to Islamist Muslim Brotherhood organizations in the U.S.
On Mr. Abudiabs public Face Book page, comments poured in, in defense of Mr. Abudiab, despite all the factual information provided. Keep in mind, the pictures, documents and quotes are not mine, but rather directly from Muslim Brotherhood organizations. Without any consideration to facts, 3 elected officials jumped to defend and apologize to Mr. Abudiab for being offended by facts. Is this what the people of Williamson County want? Each one took an Oath to support the Constitution of the United States which clearly, the Muslim Brotherhood has a different agenda. Has Mr. Abudiab been an influence on decisions made by school board members McGraw and Garrett? Will they continue to have a relationship with Mr. Abudiab if the United States does in fact designate the Muslim Brotherhood and its arms a terror organization? It is obvious Mr. Abudiab has endeared himself to those he considers able to effect change, or at least promote the myth of Islamophobia. Hardly the view of an unbiased, fair journalist. In closing, whether one chooses to believe, or likes the facts regarding Mr. Abudiab’s ties with a known terrorist organization, the Muslim Brotherhood, a pictures speak a thousand words. ← Previous Previous post: Response to Article: Are Tennessee Christians and Jews Sleeping with the Enemy? Yes. Keep up the good work Cathy. Political Islam is here to destroy American culture as stated in Federal evidence against the Holy Land Foundation.